A unique top-exit exhaust system featuring twin pipes on the McLaren 600LT supercar during its launch at the Goodwood Festival of Speed on Thursday. WEST SUSSEX, England -- McLaren Automotive, which saw record Canadian sales in 2017, plans to invest US$2.1 billion as it prepares to launch 18 new cars by 2025. 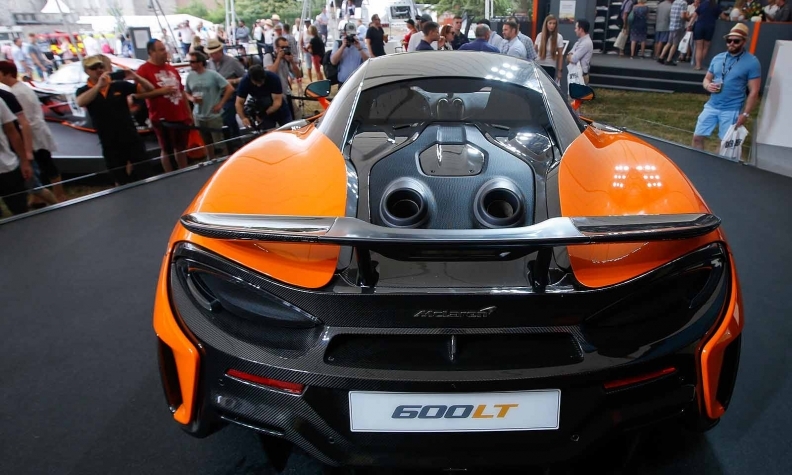 Electrification will be a cornerstone of McLaren's investment, the British automaker said Thursday at the Goodwood Festival of Speed in rural southern England. McLaren, of which Canadian Michael Latifi owns 10 per cent, plans to convert its sports car and supercar fleet to hybrids by 2025 as it prepares for tighter emission standards around the world. "The only way we can meet the emission standards at the performance we want is to be hybrid," McLaren Automotive CEO Mike Flewitt said. "There's no other way." McLaren is in the early days of exploring a fully electric vehicle, which could arrive by 2025. "The world is going in that direction. I think legislation will drive us in that direction, and we need to be ready," Flewitt said. "We would probably test the market with a limited volume to see if the appeal is there." For now, though, McLaren customers don't appear to be clamoring for battery-powered supercars. "I've honestly never had a customer ask me for an electric McLaren, ever," Flewitt said. For a sports car brand, performance is paramount. And achieving that with battery-electric technology is the challenge. A McLaren EV would have to deliver a range of 186 miles and be able to do 30 minutes of track driving, or 10 laps at the Nardo (a high-speed test track), without having to recharge. "It won't just be lower emissions, it'll be a better sports car," Flewitt said of the proposed car. To make that happen, McLaren "most likely" will rely on solid-state batteries. Current lithium ion battery technology is a compromise between range and power, Flewitt said. "Solid-state technology takes the weight down; it takes power density up, and you can get range and power," he said. McLaren also said Thursday that it would launch a successor to the P1 -- its gasoline-electric hybrid hypercar -- introduced five years ago. The planned vehicle will include a new powertrain, which Flewitt refused to elaborate on despite much prodding. "It will be the right solution powertrain," he said with a smile. The 18 new models or derivatives are expected to boost McLaren's production by almost 75 per cent to around 6,000 cars a year by the middle of the next decade.